What does it mean if my child is holding their head to one side? Is my child’s head flat on one side? As seen in the picture above, torticollis (tight muscles on one side of the neck) is more than muscle tightness and can cause plagiocephaly (misshapen head with flatness on one side) and facial asymmetry. The standard treatment has been to treat the plagiocephaly with a cranial band to help create a more uniform cranial shape. 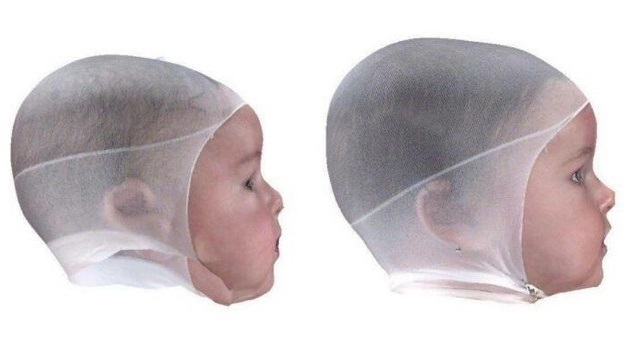 Along with the cranial band, which is worn 23 hours per day, parents are instructed to stretch and position their child. Cranial bands are costly and are commonly declined by insurance companies and only treat the cosmetic effects of torticollis. With early physical therapy intervention the root cause of torticollis, tight cervical muscles, is treated. With skilled physical therapy treatment range of motion and positioning are performed. A detailed home program is given to the family as well to ensure carry over between treatments. As the cervical muscles lengthen and the child is able to be positioned the cranial shape will naturally improve. While the cranial shape improves the facial asymmetry will also improve. The end result includes not requiring an expensive cranial band, improving the cause of the torticollis and maintaining proper developmental milestones. Below the picture demonstrates how effective physical therapy can be. In the 3 month old picture it is evident that the patient had severe torticollis with tightness on the right causing asymmetry throughout the right cheek. After 7 months of physical therapy this patient did not require the use of a cranial band and is holding his head in the middle more consistently and facial symmetry as improved. Note the facial asymmetry Improvement with Physical therapy 9x/month. The baby’s right cheek is more symmetrical and he is opening his right eye more as well. You can also see the improvement of head shape on the right side, it is more uniform and round. During physical therapy sessions stretching and positioning will be the focus to improve neck range of motion and better movement patterns for your child. Below are some illustrations of some stretches and positions that may be used. Stretching to the opposite sides that the child prefers. Education on proper ways to hold your child and promote a stretch, using comfortable positions for parent and child. Tummy time will be implemented to promote weight bearing throughout both arms and to promote head control. • The best way to treat torticollis is to encourage your baby to turn his or her head in both directions. This helps loosen tense neck muscles and tighten the loose ones. • When putting your baby down to sleep, position him or her to face the wall. Since babies prefer to look out onto the room, your baby will actively turn away from the wall and this will stretch the tightened muscles of the neck. Remember to always put your baby to sleep on his or her back, as this helps reduce the risk of SIDS. • During play, draw your baby’s attention with toys and sounds to make him or her turn in both directions. • Lay your baby on your lap for tummy time. 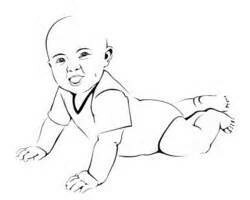 Position your baby so that his or her head is turned away from you. Then, talk or sing to your baby and encourage him or her to turn and face you. Practice this exercise for 10 to 15 minutes. • Perform stretches daily that are shown to you during physical therapy treatment sessions. What Interventions will a Physical Therapists use? • Therapeutic tape to decrease tension throughout tight muscles and also to improve strength throughout loose muscles. • Coordinate care with physician and recommend any other medical interventions that may be needed such as cranial bands, botox (to assist to relax tight neck muslces), other therapies that may be needed to maintain proper development. If not addressed, torticollis can interfere with development of gross motor skills like rolling, sitting, and crawling. Torticollis can lead to permanent head malformation or facial asymmetry. If severe, a child may be at risk for scoliosis, temporomandibular joint (jaw) problems and visual problems. If you are concerned that you baby may have torticollis please contact us for an evaluation.